With its navy base and repeated Japanese 'fan' motif in light blue, the Brindisi 26 women's silk shortie pyjama set is both stylish and luxuriously comfortable. 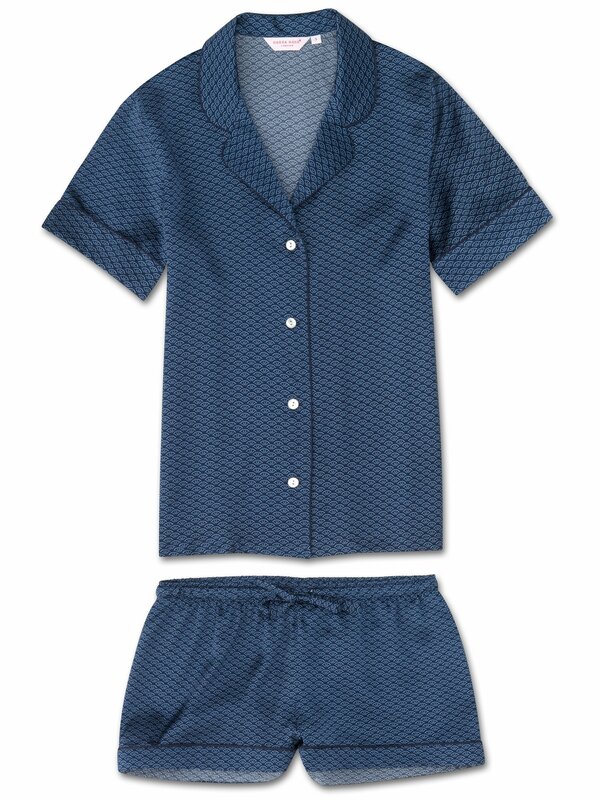 Produced in extremely limited quantities and the result of hours of loving craftwork by our skilled pattern cutters and seamstresses in our English workshop, this luxury PJ set is cut by hand to ensure we uphold the supremely soft and smooth satin finish. The short sleeve jacket features a fully piped finish in a navy trim, rounded feminine collar and mother of pearl buttons. The quality of craftsmanship continues with the shorts and their elasticated waist, piped cuffs and self-fabric drawstring for added comfort.